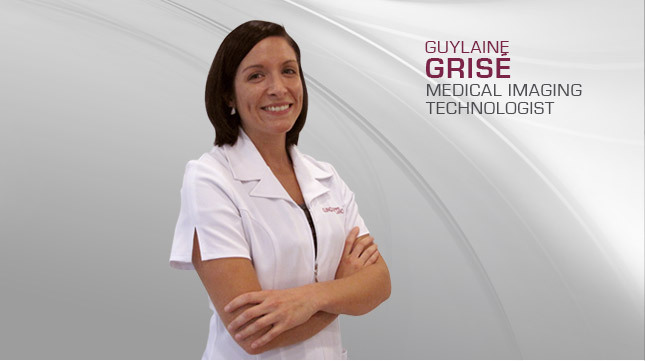 Guylaine Grisé has extensive experience in the field of specialized medical imaging, beginning her career in 2006 at CSSS Champlain–Charles-Le Moyne in Greenfield Park. She started out as a General Radiology, Computerized Axial Tomography (CAT) and Mammography Technologist, and then worked as a Sonography Technician and a Technical Sonography Coordinator. She is currently working in her field of specialization as a Vascular Sonography Technologist. She has been a member of the team as Dr. Pierre Larose’s clinic since 2012, putting her expertise and meticulous approach to good use on a daily basis. In addition to her involvement at the clinic in Quartier DIX30, she also works at the vascular physiology laboratory at Hôpital Charles-Le Moyne.